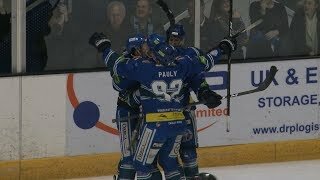 Ben Lake scored a dramatic winner with 13 seconds to go as the Genting Casino Coventry Blaze overcame a stubborn Glasgow Clan side by a score of 2-1 at the Skydome Arena. 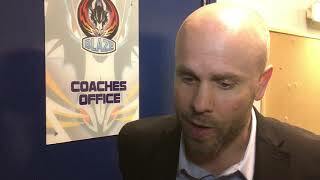 Czech netminder Miroslav Kopriva made his debut for the Blaze in goal, going on to stop 25 of 26 shots to claim the Man of the Match award for the home side. At the opposite end Joel Rumpel was the star of the show for the Clan, saving 40 of 42 shots and frustrating Coventry all the way until the 51st minute. Despite having much of the pressure, Blaze fell behind at 34.37 through Rasmus Bjerrum on the powerplay, the Clan's only successful attempt from three opportunities. Coventry too were restricted to the single powerplay goal from a total of six attempts, but it was a very welcome one as Tim Crowder from Alex Nikiforuk, his first of two assists, tied the game at one on 51.36. With the clock ticking down, Blaze continued to push for a winner and it finally came with just 13 seconds remaining through the in-form Ben Lake.